This is the perfect set for singers who wish to ensure their voice is in top condition. Vocal Exercises : Graded vocal exercises to warm up your voice and acquire good singing habits and excellent to play in the car on the way to rehearsal or your concert. Vocal Strength & Power (with audio download) : Based on years of teaching and research, this book/downloadable audio pack by acclaimed vocal coach Dena Murray provides insightful methods and exercises for attaining vocal mastery. 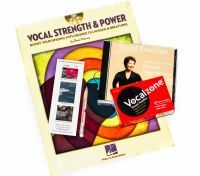 Vocalzone : Vocalzone Throat Pastilles are a unique blend of natural ingredients formulated to provide powerful relief from irritated throats caused by excessive singing and speaking.